Dung: Actually, being a dentist was my dream from when I was a child because I wanted to do something in the medical field. And when I was in my senior high school, I was interested in odontology specifically because I felt that dentists can bring not only “health” but also “beauty” to people. So I chose to be a dental student. 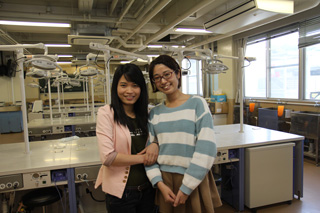 Okamoto: I chose dentistry because I wanted to get involved with people. I was interested in not only getting involved with people but also in helping them. A dentist does both, that’s why I decided to head for dental medicine. Despite the numerous medical fields, I chose odontology because I was especially interested in the oral functions such as “chewing” and “utterance”. I believe that many such functions that make humans human have their origin in the mouth. I decided to become a dentist because I wished to be involved with those functions. I see. When you were a child, what kind of feelings did you have toward dentists? Okamoto: Well, I had almost no bad teeth, so I didn’t experience drilling or other painful treatment. My dentist was working very diligently and cheerfully and for me, the dental clinic was a very pleasant place. Dung san, could you tell me a little bit about dentistry circumstances in your country? Dung: In my country, entrance examinations for the universities for dentistry are very difficult. People who dream to be a dentist are many, but people who can enter are just a few. Every year my university just allows one hundred students to enter, so it’s difficult. However, I think if once you can enter the university it’s not difficult. I mean, we have enough support from government to study. Studying dental medicine is very difficult, I suppose. But now in addition you are studying in Japan. It sounds very tough to me. Why did you decide to come to Japan? Dung: There were many reasons that made me want to come to Japan. At first, I thought studying abroad was also one of my dreams because studying abroad improves many things. Then, the second (reason) was that Japan is a developed country, so the techniques are much more advanced, compared to other countries. If I had studied in Vietnam, I would have been a regular dental student, and then I would go on to graduate to be a dentist, but here, the chances for a better future are much more. I could gain enough knowledge about many things. I could also be a researcher in molecular biology and do many things. And now I can be much more than a regular dentist! Okamoto san, you went on a short-term study abroad to Canada last year, didn’t you? How was your impression of that? Okamoto: This time, I went to study abroad at UBC (The University of British Columbia) which is located in Vancouver, Canada on the advice of my Professor. Primarily joining the third or fourth year classes, I had classes about dental care and training in the third year classes and mainly patient care in the morning and afternoon fourth year classes. I had to research about Canada to some extent before going there, but seeing it with my own eyes was rather different than hearing about it. In addition, I have learned many things from the attitude of the students there. Fourth year students have to look after the patient alone so there is only a year’s gap between third year practice and fourth year clinical practice. 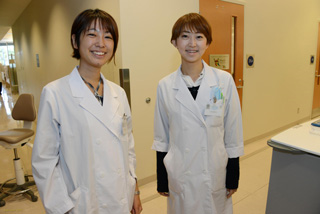 In that short term, the students make a daily effort in order to improve themselves to be able to examine the patient. Also, I was surprised at how the students discussed the treatment plan of patients on an equal basis with the instructor. Thinking about how things would go, I worried since that was my first study abroad, but I improved in one month and soon became accustomed to English by talking with university students and patients who came to the clinic. Now, my aim is that I want to hold a discussion with the local people about my expertise, and share knowledge. That was a meaningful experience, wasn’t it? By the way, was it difficult for you to prepare for the entrance examination of Hiroshima University? Okamoto: Yes, when I became a high school student, I was always conscious of the entrance exam. But I started to make a serious effort to reach my goal when I was in the 3rd year of senior high school. Immediately before the examination, I was studying as much as possible. I also went to a cram school. How about you, Dung san? Wasn’t it difficult to enter the HU International Dental Course for you? Dung: Actually it was quite difficult because after I finished the first year in the University of Medicine and Pharmacy at Ho Chi Minh City, they chose me among the top students who scored the highest. Then we had to write essays on reason for application and purpose of research and take multiple interviews to enter this program. 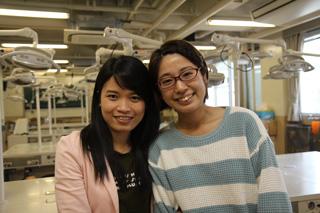 What’s your first impression when you came to Japan and took your first dental class? Dung: At first I was so excited about my first class that I could not sleep. When I joined, I felt the English-Japanese dual linguistic education was a bit difficult but I could soon overcome it because the teachers were so kind and explained everything in Japanese and English so I felt really relieved. Also some of my Japanese classmates are very diligent, so I think I need to study more. Okamoto san, do you feel stimulated when you have lessons together with international students? Okamoto: Yes, I am very stimulated. International students in my class have an extreme desire to study. They absorb information very quickly, understanding things quickly. So I always try to keep up with them and that helps me to improve myself. Also we can improve ourselves by discussing important contents of the lesson, etc. Was it easy to get used to a lesson in both Japanese and English languages? Okamoto: At the beginning, I felt very confused. But after some days I gradually got used to it. Now I don’t feel embarrassed. Also communication is not a problem. I talk with the international students about many things using English and Japanese. That is my favorite time because we can understand about each other more. Could you tell me how your teachers perform lectures or trainings in the dual linguistic education system? Dung: For the lectures, they write the slide in both English and Japanese. Sometimes when they write English sentences they translate the technical terms in Japanese so that both the Japanese students and international students can understand. About the explanation, they explain first in Japanese and second in English. On the other hand, during a practical, it is a little difficult to explain both in English and Japanese using technical terms as well as doing practical exercises. So in some of the trainings they explain in both languages and in some practicals they just explain in Japanese after which a teacher comes to the international students and explains clearly in English so that we can do the practical. What kind of lecture or practical did you consider meaningful? Okamoto: One of the most unforgettable lessons is the anatomy practice in the second year. In that training, we dissected a body and learned the position of the tissues. Each group consisted of 6 students with at least 1 international student. At first, the teacher explains everything in English. Then we studied step by step by communicating with international students. Actually we learned a lot of English on this occasion. As we had to communicate in English and we stuck together, this lesson made the biggest impression on me. Dung: I’m a dental student so all the subjects regarding dentistry are so new and interesting for me. If some must be chosen, one is the anatomy practice as Okamoto just mentioned. In that class, we make a group and then I can study and communicate with the Japanese students. When we make a group, it’s such a nice time for me to get closer with my friends but the subject is a little difficult. Personally, the most interesting part is the dental practice that is prosthetic practice, making the crown and bridge. When I make a model, the teacher explains it to me in English then I can do the practice. How many hours do you study at home? Okamoto: It depends. After a practice or a difficult lecture I study about for one hour, glancing through the resume. I go to the library very often, too. Dung: Actually it depends on the subject and the schedule. I often take time to review the lecture after class but that’s like the regular study but if it’s before a test then we need to concentrate and focus more to study. I study until I can do the test. What do you think of Hiroshima University’s library? Dung: It’s very nice. When I came they had already prepared the textbooks written in English in the library so all the international students could borrow and study the textbooks. The places for studying are also very good so I like that atmosphere and often go there to study. When you are in trouble, how do you cope with that? Okamoto: When I meet with difficulties I always experience anxiety and wonder what I should do. This feeling is leading, but I try to analyze why this trouble occurred and what would be best to do. I create several options to cope with such problem. Furthermore, I try to cool down as much as possible. How lucid! How about you, Dung san? Dung: I’m lucky because when I have trouble with my studies, I can always ask my friends. If my friends can’t explain the problem, I can ask the professor who conducts the lecture. But in life, I am studying abroad so it looks so hard. But I always try to know why I encountered that problem. If I cannot solve it by myself, I go to the Student Support Office. Besides, I also have strong support from my family. I can call my family or talk with my friends. So the stress can be reduced and I can overcome the problem. Did you encounter any trouble regarding culture differences? Dung: Not big troubles. But sometimes I find it a little difficult for not understanding Japanese culture. But by encountering troubles I can get to know more about Japan. It becomes a nice experience. Then it is not a trouble anymore. You are very positive! By the way, how do you spend your free time? Okamoto: As I’m in the orchestra club called “Kasumi Orchestra” and play the cello, I usually join the trainings on Saturdays. Further, spending time with my friends is very important for me. We go out to eat or hang out together. Why did you choose the cello and not the other musical instruments? Okamoto: It sounds very nice. I like it. And it gives me a feeling of security (laughing). Dung: In my free time, I often meet up with my Japanese and international friends from Hiroshima University as well as other universities. 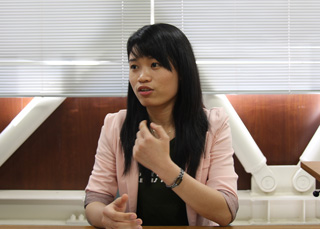 Also, I often meet up with my Vietnamese friends and go shopping or around Hiroshima City. Do you often join university’s or local events? Okamoto: Yes. One of the biggest events held on our campus is the Hiroshima University Kasumi Festival. During the festival, as there is a club called HUDIC which is promoting international exchange at the Faculty of Dentistry, we make a festival booth and together with other international students sell food from their countries. Last year, we sold “banana fry”. “Banana fry”? From which country is that? Okamoto: From Indonesia. It is also in Vietnam. It’s a dish made of fried bananas, literally. It sounds simple but delicious! Dung: That’s right! 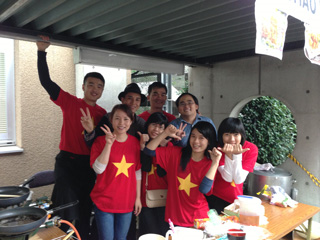 Then as for local events, at the International House or Ryugakusei-kaikan, they also have international festivals so there I sold Vietnamese food such as “pho” and “age-harumaki” or fried spring rolls together with my Vietnamese friends. Could you give any advice for future students of dentistry? 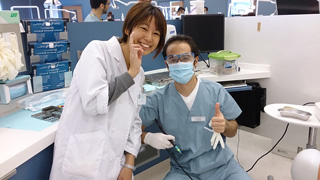 Okamoto: Well, I think many people think that dentistry is only confined to “teeth issues”. But in reality, the field is very wide and deep. Learning about oral cavity is the main subject, but as you progress, you will realize that knowledge in other aspects must be gained as well. It is up to you to decide how far you would like to expand your knowledge. I believe that your motivation can change the world of your dentistry’s scale unlimitedly. In addition, when you are on campus, you are mainly together with colleagues from the dentistry, but I think that it is important to actively exchange with people from various domains. Thank you. Dung san, do you have any advice for students who are willing to study abroad? Dung: To study abroad, I think the most important thing is that the person must have an open mind to accept new things. Then I think the other important thing is positivity. Studying abroad sometimes gets difficult and you may be in trouble many times. But if you know how to overcome it, it will be a nice experience, and then you can gain knowledge about many things. Thank you. Do you have any advice for friends who wish to study abroad but shy, and can’t make many friends? 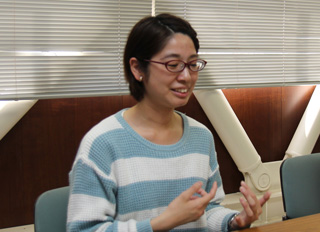 Okamoto: Some students may think that they have to speak perfect English from the beginning. But there are many different ways of communication. For example drawing pictures, gestures etc. I think it is very important to have the desire to express your feelings or to get information on your new friends by using all of these methods of communication. Dung: I think the first time you speak another language or go to some strange country that you have never been to, it must be a worry and you feel shy or many things, but in this case, you should think of your motivation and why you want to go. The motivation will motivate you, and then it must be an internal strength. And if you dare to change, you can get more confident in communicating with others and go abroad. What’s the most important thing for international exchange? Okamoto: As I have just said before, the desire to express oneself and to know others is important. Additionally, I think it is also important to learn about your new friends, for example, their languages with enthusiasm. Dung: In my opinion, the most important things are, first is the eagerness to learn or to get knowledge. The second thing is to make friendships. “Knowledge” and “friendship” are important. Last question. What kind of dentist or international leader would you like to become in future? Okamoto: Globalism is progressing and I think that my future career shouldn’t be limited to Japan. Now I have the chance to study together with Dung and other international students. I think that I should know the situation of dentistry in their countries, absorb as much information as possible avidly and eventually find a new way combining traditional Japanese methods with new ones. Dung: Well, I think I want to be a world-class dentist, too. I mean, not just a dentist in Vietnam, but I want to treat patients from all over the world and to know many cases in order to get knowledge. Also, I want to join international conferences where I can network and share knowledge and friendship with other dentists. So, I will be a clinical dentist and also a researcher to improve the treatment techniques and also research. Actually, I want to do both.